Earlier this month, Caroline and I were able to take a little vacation up to New York City. We were looking forward to it, since it would be the first trip we've taken without a toddler in tow. And while we love Jonah dearly, it was nice to be able to travel without catering to the whims of a toddler. We were able to sleep in some, to not have to worry about navigating a large city with a small child, and to not have to be back at the hotel for an early bedtime. We missed him while we were away, but he was well taken care of by his Aunt and Grandparents back home. I was also looking forward to visiting New York again. I had only been there once before, way back in 2006. But we were only there for just a weekend, so we didn't get to see too much. 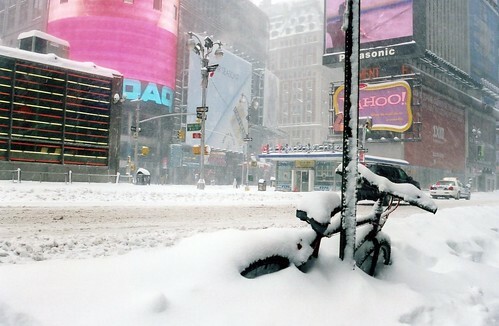 Also, a blizzard moved in while we were there and dumped about three feet of snow on the city. It made things a little bit more interesting while getting around the city, but it was amazing to see the city with all that snow. The weather looked like it was going to be a little bit nicer during the time we were there (it did snow, but it didn't really accumulate much). Our hotel was located right by Grand Central Station, so we ended up passing through there quite often. It really is a grand old building, and it's easy to see why it's one of the most visited tourist attractions in the country (with an estimated 21.9 million visitors passing through it every year). 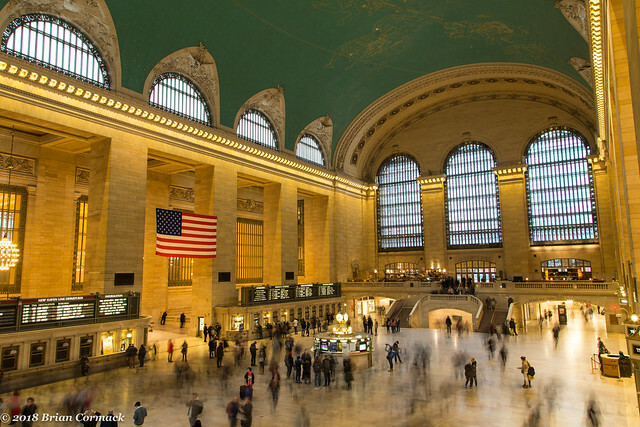 Despite being over a hundred years old, Grand Central Station still holds the title of largest train station in the world with 44 platforms. The terminal opened in 1913, and cost $43 million to build (it would cost about $1 billion today to build it). Why so expensive? The construction required the excavation of nearly 3.2 million cubic yards of earth, digging to a depth of 45 feet to allow for the train yards, platforms and utilities. The massive construction used 118,597 tons of steel to create the station's structure and about 33 miles of track. At the peak of construction, 10,000 people were working around the clock to build the terminal. 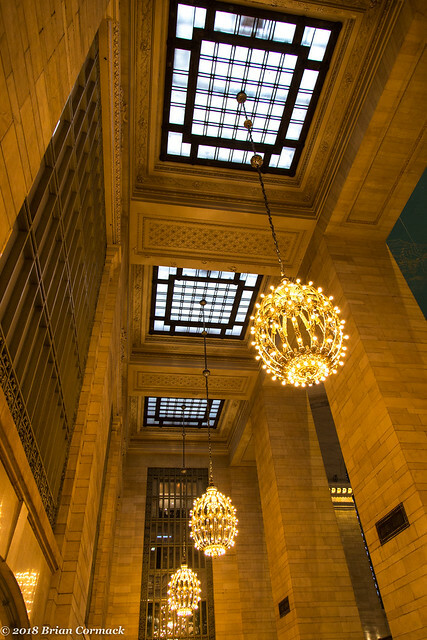 The heart of Grand Central is the Main Concourse, which was crowded with travelers and tourists on each of our visits. The concourse is definitely large enough to contain all of the crowds, with a massive ceiling that is 125 feet high. 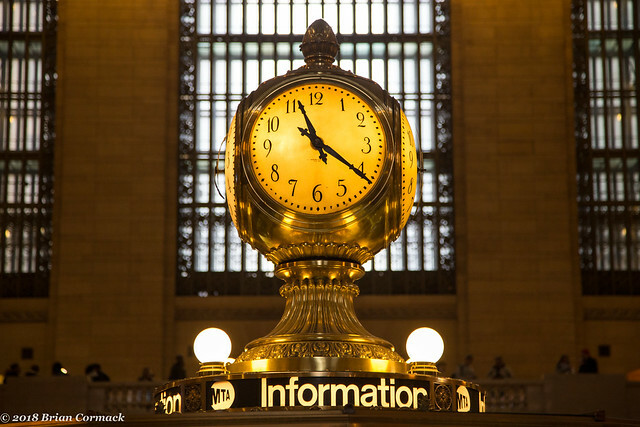 In the center of the concourse is this large brass clock, with several claims that the clock face is made of opal and has been valued somewhere between $10 to $20 million dollars. But for all of its scale and grandeur, the station was nearly torn down. After World War II, there was a steep decline in rail travel and there were many who thought the terminal had outlived its usefulness. In 1953, there was a proposal to tear it down and replace it with a 80 story skyscraper designed by I.M. Pei. That plan never came to fruition, but decades of neglect began to take its toll on the building. In 1968, another skyscraper proposal was developed that would have destroyed most of the building's facade. The plans faced some steep opposition, including from Jacqueline Kennedy Onassis, who wrote: "Is it not cruel to let our city die by degrees, stripped of all her proud monuments, until there will be nothing left of all her history and beauty to inspire our children? If they are not inspired by the past of our city, where will they find the strength to fight for her future? Americans care about their past, but for short term gain they ignore it and tear down everything that matters. Maybe... this is the time to take a stand, to reverse the tide, so that we won't all end up in a uniform world of steel and glass boxes." It worked, and the building was again spared the wrecking ball. 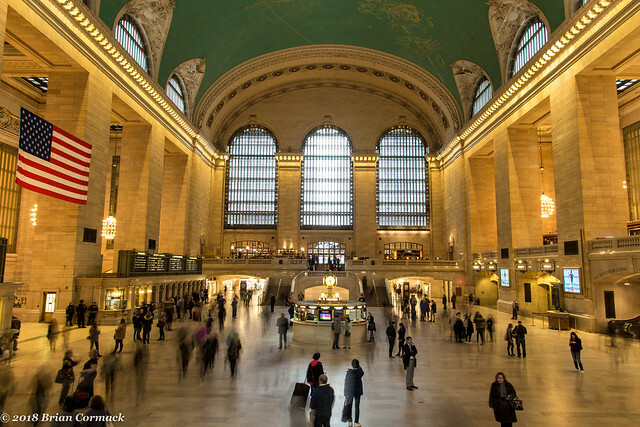 Grand Central Station was granted landmark status, and finally a massive restoration and clean-up began in the 1990s that removed all of the massive billboards that used to clutter the grand building's interior. The station's ceiling received a cleaning, revealing again the elaborate astronomical designs that had been obscured by a thick layer of tar and nicotine from several decades worth of cigarette smoke. 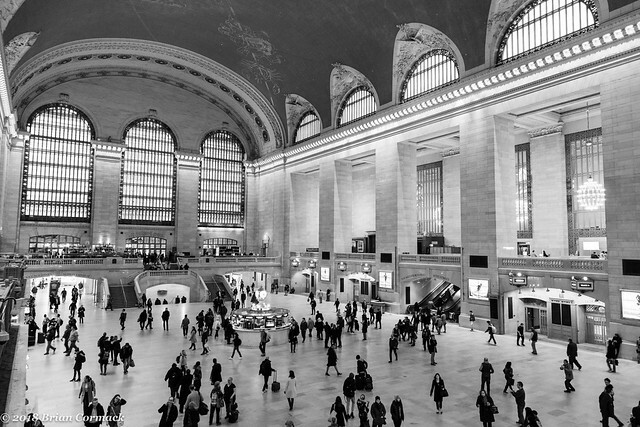 It's hard to imagine a New York City without Grand Central Station, and it was an amazing place to walk through and take pictures. Here's one last shot, from a balcony overlooking the Main Concourse. 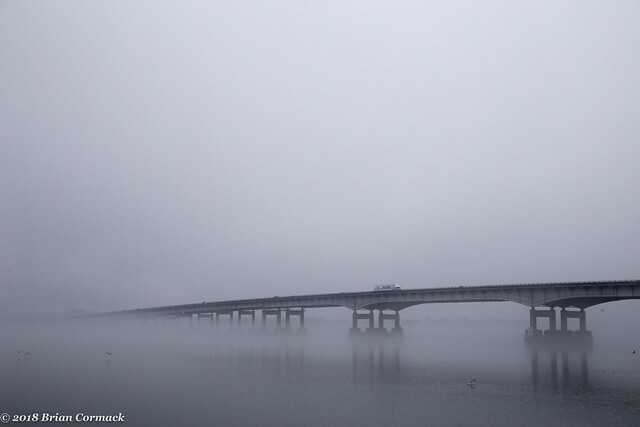 Last Saturday, I was driving over the I-430 bridge and saw that the river below was coated with a delicate layer of fog. 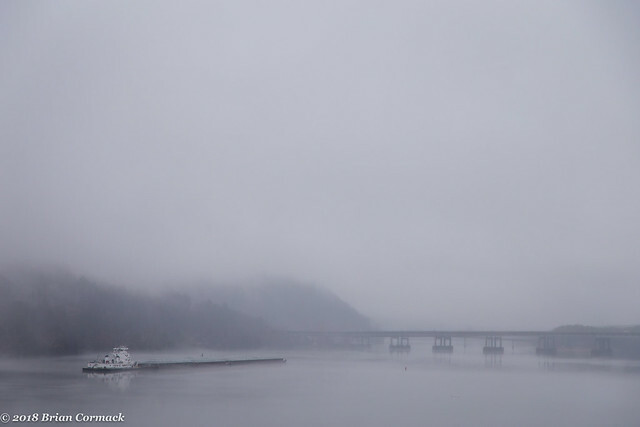 Low clouds clung to the tops of the hills that line the river, drifting through the naked branches of the pine and oak trees. It was good conditions for photography, and luckily I had my camera with me so I quickly headed over to Two Rivers Park to have a look around. 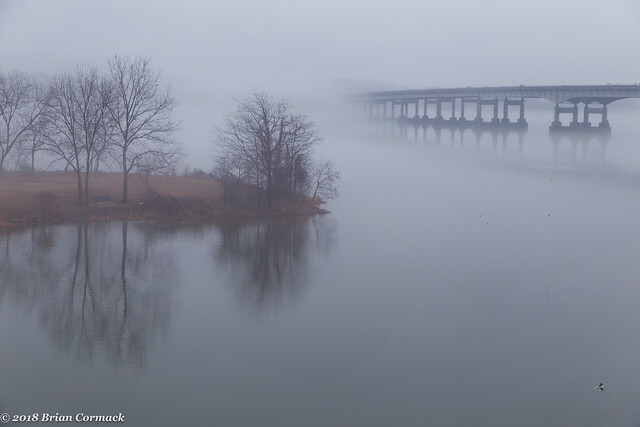 From the Two Rivers Park Bridge, the fog did a pretty good job at obscuring the nearby freeway bridge. 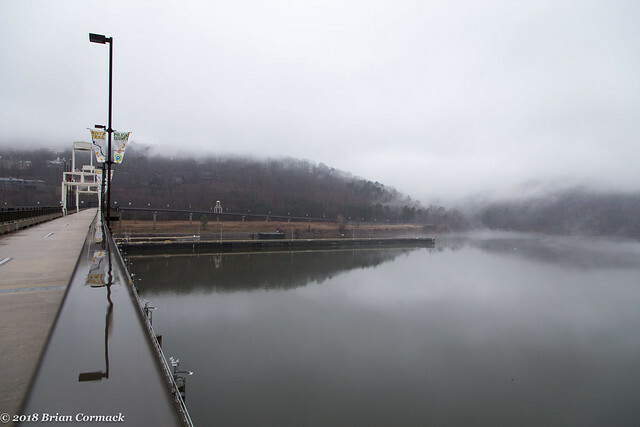 From there I headed downriver and went to the Big Dam Bridge, where there were quite a few people out jogging despite the dreary weather. 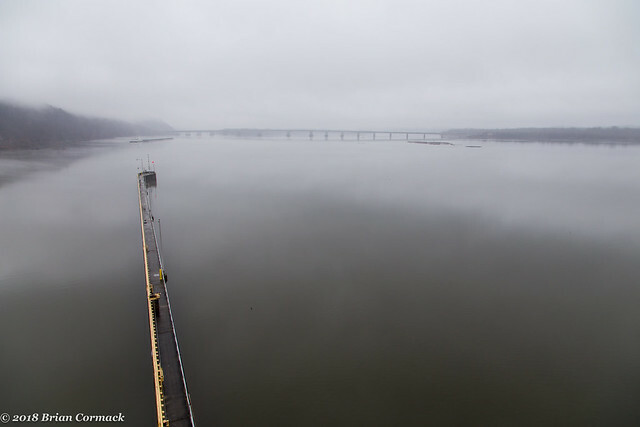 This was taken looking upstream, with a barge slowly making its way upstream towards the I-430 bridge. And the view looking west, or well whatever view you could see through the fog. And before heading back to the car, I got one last shot of the bridge. I carefully placed the camera on the rail, holding on tight so the camera wouldn't drop into the river.